Western Digital is a well-established brand in the world of storage devices right next to Seagate and they are out to push the boundaries with WD Black, a NVMe SSD aimed at gamers with storage capacities up to 2TB. Solid State Drives are more reliable, faster and easier to store files but they are very expensive for many years now. People are still forced to rely on platter based hard drives for huge files whereas SSDs have found their way only as primary storage devices for the operating system. Things are slowly changing and the new launched from Western Digital is bound to push the adoption further. The Black SN750 NVMe SSD is available in a range of storage capacities that start 250GB and goes to 500GB, 1TB and 2TB being the largest of the lot. Almost every other AAA title released on PC these days go up to 100GB with 4K textures and super high quality audio. WD believes it is only justified for the storage industry to adopt and also help bring down prices while delivering speed. 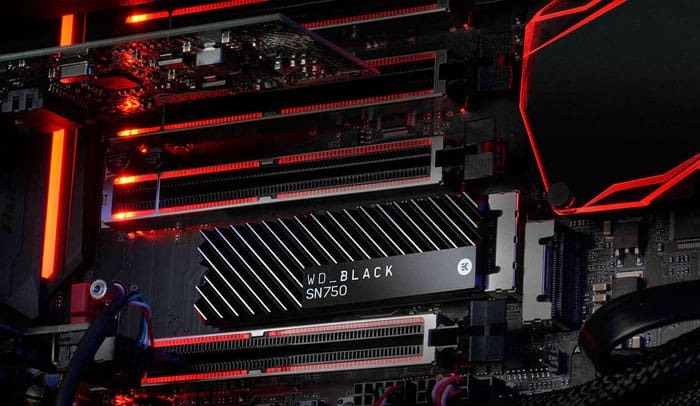 The WD Black features a gaming dashboard where gamers could easily tweak the speed and performance of the SSD if they are getting into competitive, multiplayer titles. The overall performance can be switched to power saving mode when you are playing single player titles. The top of the line 2TB model has read speeds up to 3,400MB per second and 2,900MB per second write speed. In terms of pricing, the entry level 250GB model is cheap at $79.99 whereas the 2TB version costs $499.99 which is rather expensive unless you have already finished setting up your mammoth gaming PC that just needs more storage.